So you didn’t get tickets to Prince. Don’t fret; you can still eat breakfast with Shaft and Stevie Wonder if you head to the Blue Chair café. And that’s exactly what I do. This wee blue gem is a must. Bursting with quirky cool, it’s the perfect place to unleash your inner creativity, culinary explorer and cake-lover. We’re treated to a delicious hearty breakfast, delightfully attentive staff and a wonderful selection of sound, including Shaft and Stevie warming up the room with their silky tones. Folk and rock also feature – so something for every ear. 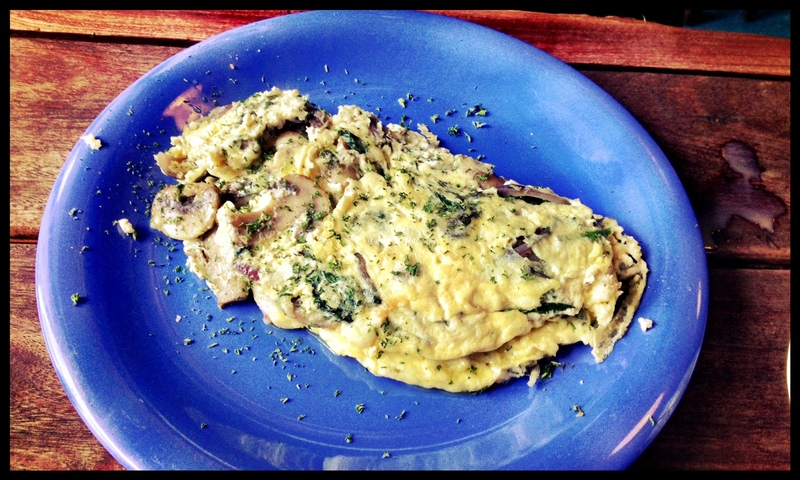 Their eclectic menu offers something for everyone – and their DIY omelette is an absolute must. Try the mixed herb, cheddar and onion for breakfast heaven. And if you’re lucky enough to get the first slice of cake from the lot, you get it half price. They also do lunch and dinner – so we’ll definitely be back for more. And Blue Chair loves an artist. In fact their café is gallery of art, poetry and instruments. 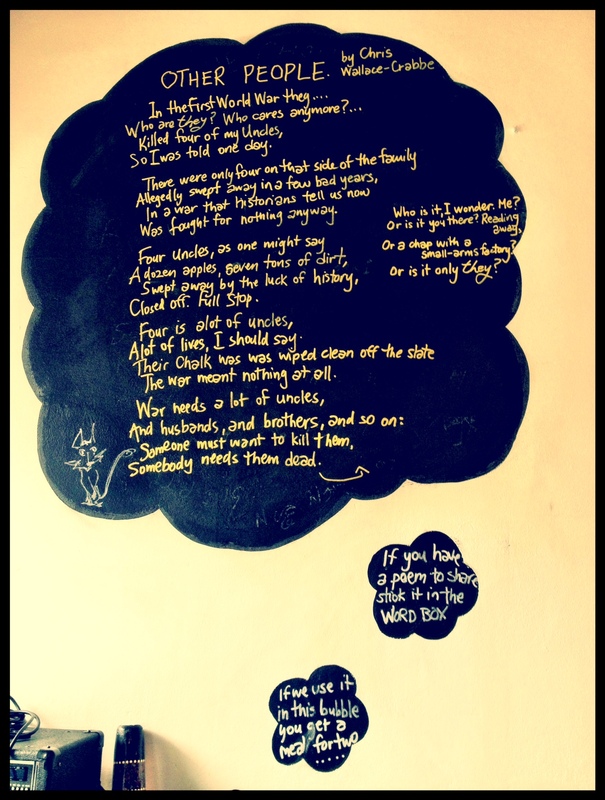 So go on, submit your best words to their poetry box for a chance to feature on their bubble wall. If you’re poem makes it, you get dinner for two. Excellent! Their evolving evening menu coupled with BYOB and the possibility of being treated to a performance makes it irresistible. Or if you’d rather listen, then why not enjoy their spoken word night happening the last Friday of every month from 7pm. Storytellers, poets and songwriters all welcome. Whether you missed out on the Purple Rain or are feeling Let’s Go Crazy elated after the show, Blue Door is the perfect place to commiserate and celebrate. So go enjoy their simple but sensational food for the body, mind and soul. Never been wowed by words! 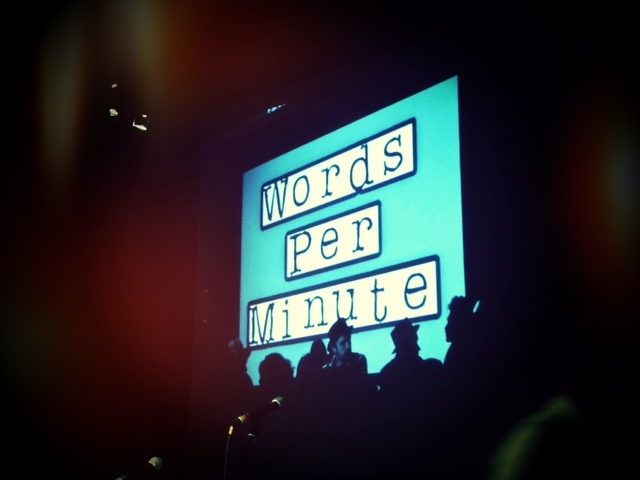 (Gasp) Check out Words Per Minute – but make it fast! This fantastic spoken-word extravaganza is coming to an end with their last show this Sunday 6 May at the Arches, 4pm. If you’ve been to a spoken word event before but been disappointed or never ventured fearing boredom, drivel or pretentiousness, allow WPM to ease your mind and pleasantly surprise. For the last few years it’s been showcasing the best of new and more established writers and performers with a few songs and other creative antics thrown in for good measure. Truthfully when I went along I didn’t quite know what to expect but any apprehension quickly dissolved. It’s relaxing, welcoming – really almost like hanging out in the living room of a friend – an energetic, engaging and thought-provoking friend – who just happens to have a stage and a microphone. Champions from the UK vs. USA Sunday special were definitely the humorous and expressive American Samuel Taradash and the utterly fantastic London-based Caroline Bird. Both were captivating, convincing and effortlessly took us along on their wonderful, word-fuelled journey. This laid-back gathering celebrates words in all its many form – speaking, singing, reminiscing, ranting and recounting. It provides rare intimate moments where performers share their inner workings and writing (close up), interacting with you in a way that words on a page could simply never do. My only regret is that I didn’t go long before their penultimate show. We’ll wave goodbye to this fantastic regular Sunday statement of expression on the 6th. But WPM promises to rise and read again – becoming nomads that pop up every from time-to-time. So, go on – make the most of your (possibly long) weekend. Do something a little different and witness words alive at this final hooray at the Arches (£5).